War Serenade was first brought to life by my mother. It was my favorite bedtime story, not just because it was true and quite, quite thrilling, but because in the excited telling, my mom’s expressive hands made her bracelets jingle. Though this epic love story was only named War Serenade a scant 18 years ago, it’s been a living organism in my soul for more than a half a century. I'd always imagined this WWII true romance set in South Africa, in moving pictures. War Serenade took nearly 40 years to spill from me as a 60-page essay. Like a precious gift long-lost and just-found, it delighted me anew. Who needs an unduly sleepy princess and a one-dimensional prince when you can get lost in a romantic adventure with a charismatic pair on opposite sides of a real war? When Iris and Pietro’s eyes first locked through the cage of his prison, they were unprepared for the magnitude of their attraction. They shared a passion that would force them to take hair-raising risks, just to be together for a few illicit hours. And when the world desperately wanted WWII to end, the desperate lovers dreaded the end of their world. In my naiveté, I cold-called literary & film agents in Florida and offered to send them my story. A kindly professional found it in her heart to skim those 60 pages. Yes, the story had merit. No, she didn’t have to time to take me on as a client. No, it was not yet a mature piece, but "keep writing" she said. 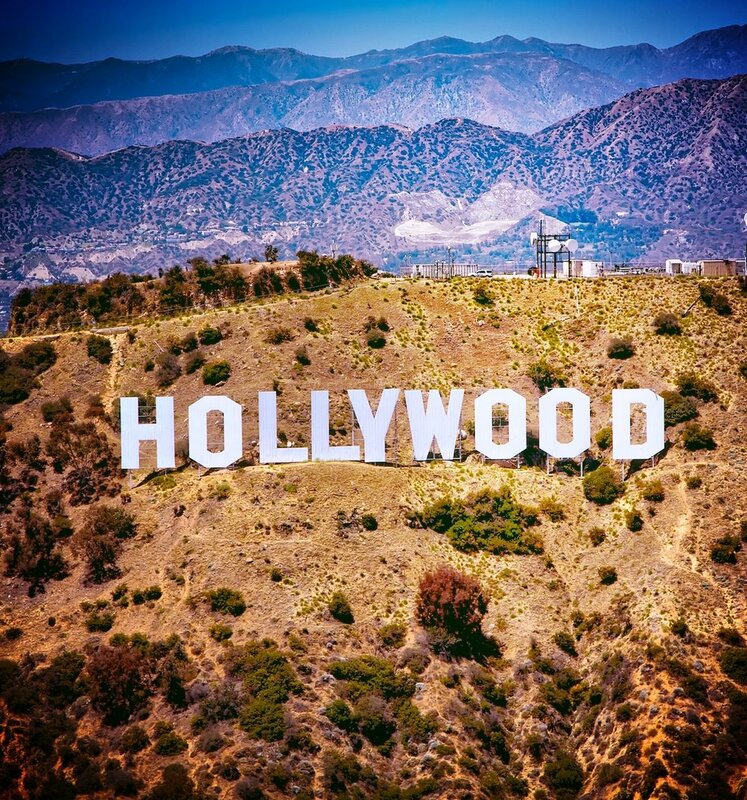 It was indeed the faintest glimmer - but to my hungry eyes, it wasn’t a random pinprick of possibility, but rather the blaze of the HOLLYWOOD sign, in all its full-bulb glory. The universe had spoken. I had to write a Hollywood script! I dove into the murky storytelling pool with gusto, determination, sheer ignorance and complete oblivion. I flew to wherever screenwriting gurus strutted their stuff. I inhaled their smarts, consumed their wisdom and emblazoned their words on my brain, like a librarian fast losing her precious sight. I read a million "How To” books. My husband gifted me a week at screenwriting boot camp for my birthday. Writing became my catnip. Two years to the day I wrote that first essay, I blew our Old-Age-Budget on pre-bought, five- minute increments of time in front of producers, studio heads and directors to introduce my screenplay. I took a jittery breath and hopped a plane to LA clasping my cabin bag holding War Serenade to my chest. Could be fellow passengers imagined I held a cache of stash. Nah! What I had was decades old and much more precious. To me. The Pitchfest was a circus, and I, one of its many clowns. One bell started the 5-minute act. I had five miserable minutes to make my impression and sell my concept before the second bell jarred my senses. If my script still burned a hole in my hand, my dream was up in smoke, at least until the next bell. “Aanhouer wen” (Afrikaans for “Only those who try again, win”) resounded in my head. So War Serenade and I lined up with a new set of performers, snapped back disappointed shoulders and waited for the next bell to ring. And the next. Two days later I wondered when exactly the bell-messages had turned me into a defeatist. The start-bell shrieked “It’s a numbers game so just get it done!” The end-bell baptized me with a wave of enormous relief - my five minutes of futility was over. I had just one more pitch before I dragged myself home to declare the mission unaccomplished. I imagined my husband and I - a pair of old lovers - hunched over the chasm that was once our savings, like last mourners at a gravesite. On I droned – my once animated pitch now a canned monotone. And then: “I’d like to read it”, said a baritone. For a second I had no idea where the voice came from. I glanced at the sign looming large behind the desk: “Producer – Independent” it read. I think I may have fainted until the bell sounded…but this time, I salivated like one of Pavlov’s hungry dogs as miraculously, War Serenade was gone from my hand and nestled in the palm of a willing stranger’s. I quivered with excitement for months. At last the call. "Great story," the producer said. My heart soared. "But I need more conflict! I can’t do anything without more conflict” he warned. "But it’s a TRUE STORY. It's a happy story. I can’t change what really happened!” I cried. For a year my rejected script lay, gathering disappointment. And then I wised up. I changed the names of the hero and heroine from the real people in my mom’s real story. Suddenly I had the freedom to make her edgier; him a whole lot darker and best of all, if I really, really, listened, my new characters would tell me where they wanted me to take them. Into the darkness, we plunged and back up, into the light. Down again. Like a rollercoaster. This was liberating. This was fiction. The call came sooner than expected. "Congratulations,” the producer said proudly, “NOW we have a movie." And I had a PRODUCER. I blacked out for at least 2 hours. A scant three months later he called, excited. “I have secured a director and have three very interested money people,” said my producer. I believe I lapsed into a short coma. I was on tenterhooks. When the call came it was not from my producer with good news, but the director he’d once briefly attached to my script. “He is gone”, she said. My producer was gone - a heart attack. What a devastating loss: for him, for his family and, I confess shamefully, for me and my baby War Serenade. My producer was a one-man-show. With him died all hope. Three years later and out of the blue, the director who I’d yet to meet, called again. A South African company wanted to option my script. She would direct. I didn’t blink an eye. Matchsticks made of disillusionment held my eyes wide open this time. Still, I was unprepared for the long tumultuous year that followed. Players all had a different game plan: The pragmatic studio? A box office sure-thing! The volatile director? An English break-out role for a hunky Italian bit-player! The producers? A lower budget! Film. An un-Collaborative Medium? What a debacle. I was doomed. War Serenade was dead. Again. And then a dear friend and successful author, who’d listened to my tales of woe for a decade or more said: "To hell with the movie. Write the book." War Serenade was published in my 61st year. Now when a bell rings, it no longer sours my belly with angst and my mouth with disenchantment. Like Pavlov’s dogs, the sound fills my world with possibility. It’s very possible the sound is not a bell at all, but the jingle of my mom’s arm bracelets from on high.